Connects any 20Pin DFP flat panel monitor to any computer with DVI port; or vice versa. Length: 6FT 1 x DVI Male; 1 x DFP HPCen20 Male. Connects any 20Pin DFP flat panel monitor to any computer with DVI port; or vice versa. Length: 10FT 1 x DVI Male; 1 x DFP HPCen20 Male. Plug & Play through hot plug detection. Resolution: up to 1920 x 1080 Compatible with Flat panel Displays, Digital CRT displays, Projectors, and HDTV. Ideal for connecting an analog DVI source to a VGA monitor or vice-versa such as a CRT or analog-compatible LCD. DVI-I Cable can handle both digital and analog. It's ideal for Computers; Home Theater; Monitor ; and HDTV's. DVI-I 23-pin Male (18 +5) to DVI-I 23-pin Male (18 +5). Higher than VGA bandwidths. Plug & Play through hot plug detection; EDID and DDC. Digital and Analog support in a single connector. DVI-I plug can only be inserted into a DVI-I interface. Length: 3 meter (9.84ft). There is a wide range of DVI Adapters and cables available at SF Cables. 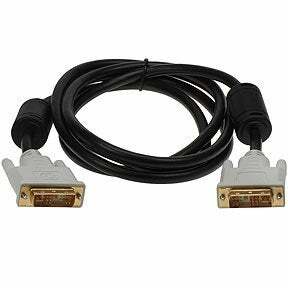 You can choose from DVI-I Digital Dual, Analog Male, Female Cables, DVI Digital Dual Link Splitter Cables, DVI Male Analog to HD15 Female Adapters, DVI-I Dual Link Adapters, DVI Female Analog to HD15 Male Adapters, DVI Male to DP Male Flat Panel Video Cables available in different lengths, Single Link Digital Video Cables, Dual Link Digital Video Cables, different DVI-A Video Cables, FullHD DVI-D Video Cable with Built-in EQ extenders, FullHD DVI-D Video Cable with Built-in EQ extender Kit, Ultra High Performance DVI M/M Cables with Power Connector, InFocus/Proxima Projector M1 Male to DVI-D Female Video Adapters, and many other products.